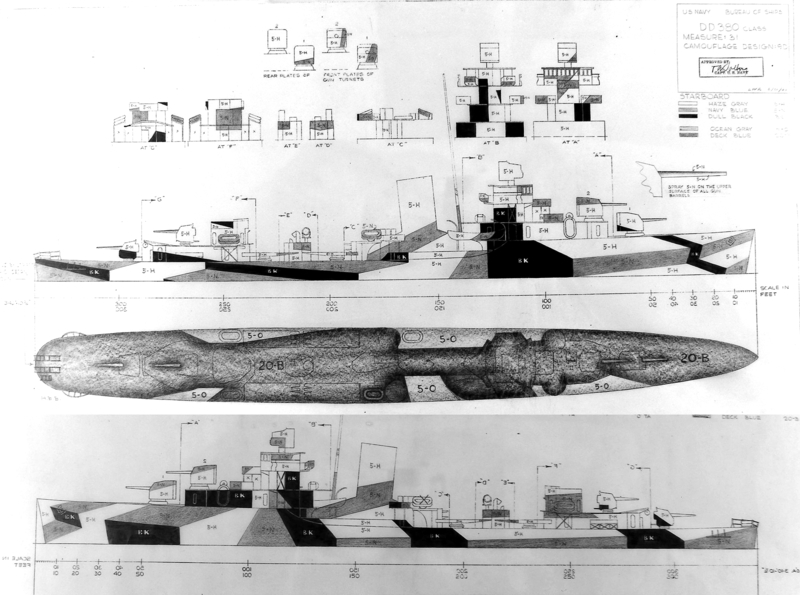 The drawing for Measure 31 Design 9D for the Gridley class; the original was dated June 30, 1944. Note the extra “stairs” on the port bow as in previous destroyer classes, but otherwise still a good match to the Fletcher drawing. There were no bow or stern views. The specified vertical colors were unusual for Measure 31: dull black (BK), navy blue (5-N) and haze gray (5-H) with ocean gray (5-O) and deck blue (20-B) on horizontal surfaces. If this were used in Measure 32 light gray (5-L) would be substituted for haze gray and possibly ocean gray for navy blue. This drawing also included treatment for the gun barrels: 5-N on the upper half and 5-H on the lower half. No ships have been confirmed wearing this camouflage. Original drawing source: NARA 80-G-100382 and 80-G-100383.